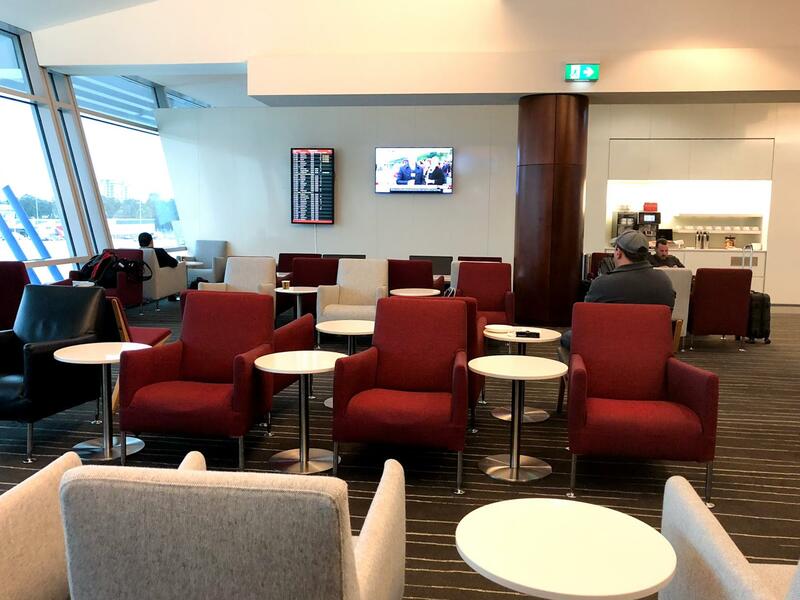 After a long overnight flight from Jakarta, I stopped by the Sydney Qantas Club lounge for a quick pit-stop before my onwards domestic connections. 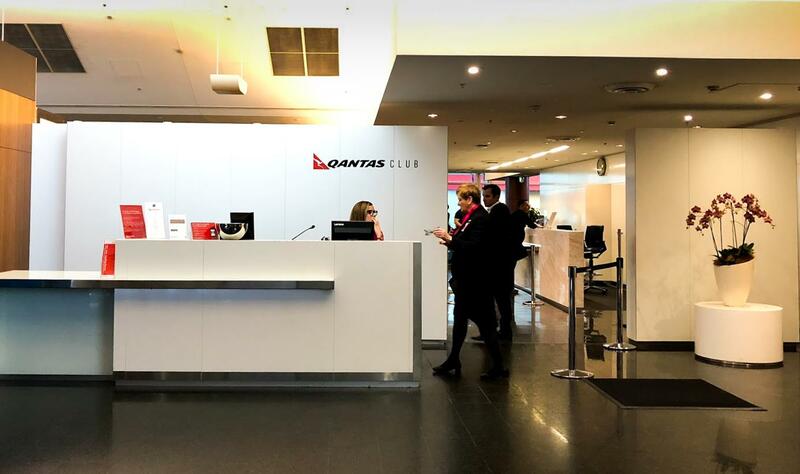 This is one of the older Qantas Clubs now, as its siblings in Brisbane and Melbourne have been refurbished. 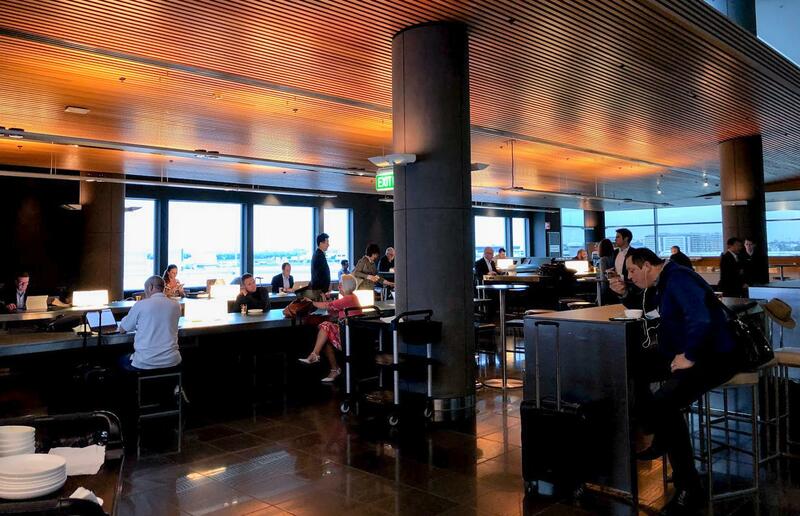 This Qantas Club is located opposite Gates 4 and 5, on the departure level of Sydney Airport Terminal 3. Walk through the lounge precinct entrance and up the escalator. 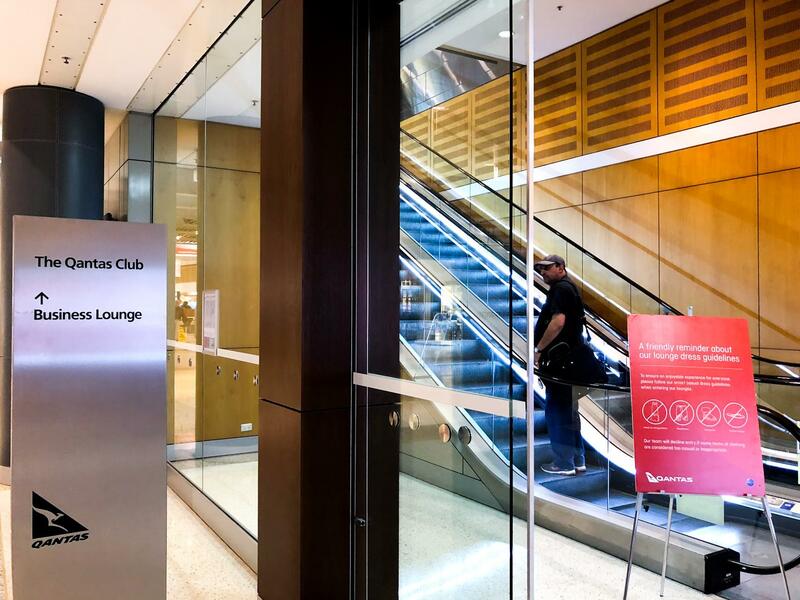 The entrance to the Qantas Club is just to your left (and if eligible, the Qantas Business Lounge is straight ahead). 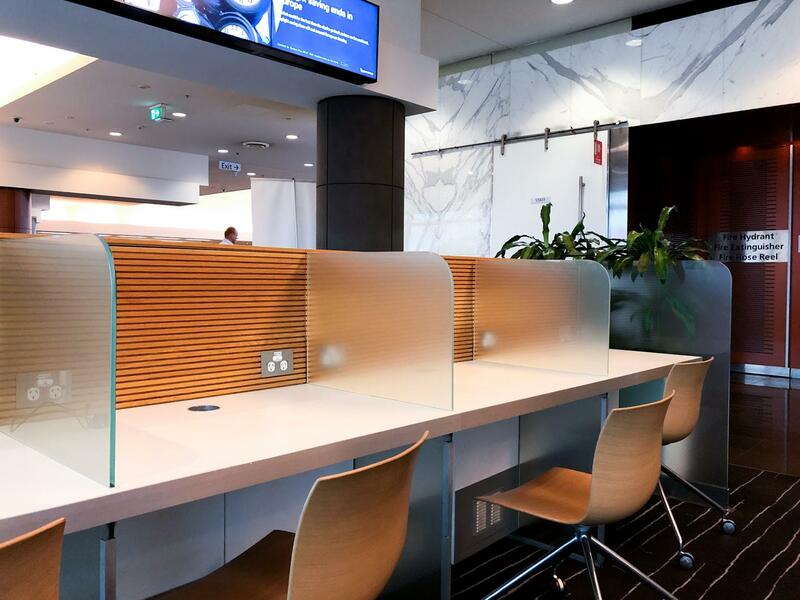 As you enter the lounge, you will find the service desk on your right. 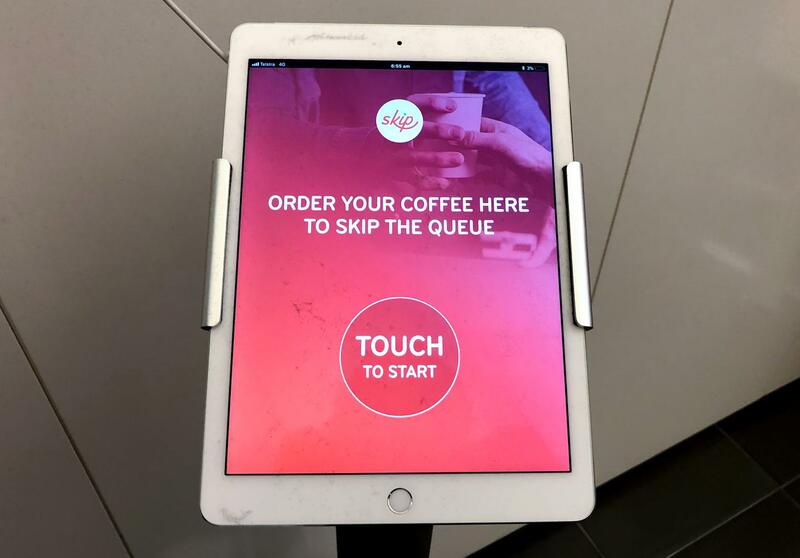 On your left, there are tablets which allow you to pre-order your coffee and skip the queue. The centre of the lounge is a main dining hall. 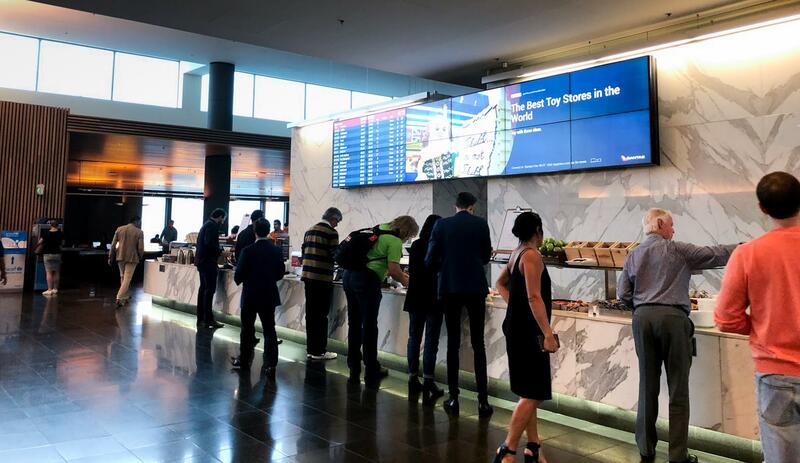 You will also find the main buffet and barista stations here (yes, they are both jam-packed in the mornings). 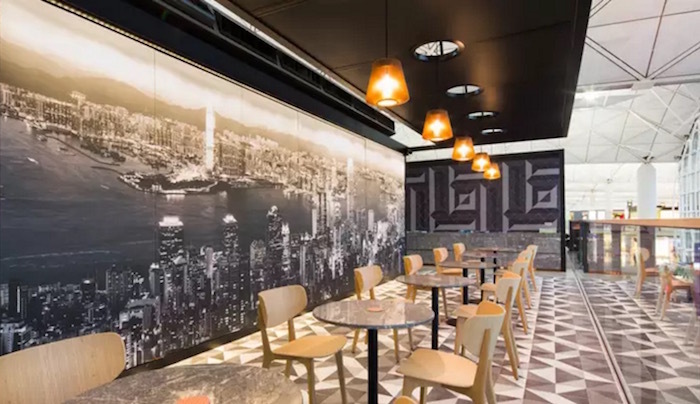 For those who likes to work and dine, there is another area nearby that is densely filled with high tables and power ports. 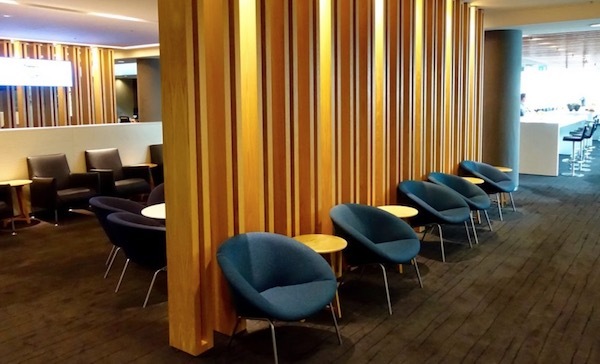 The left end of the lounge has a refreshed decor, with wooden flooring and new furniture. 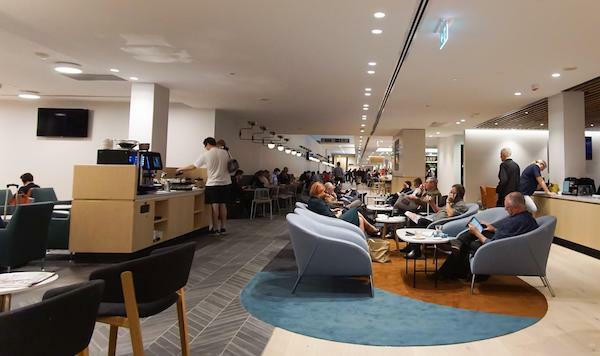 There is plenty of comfortable seating around here and it was significantly quieter than the dining area, even during peak hour. 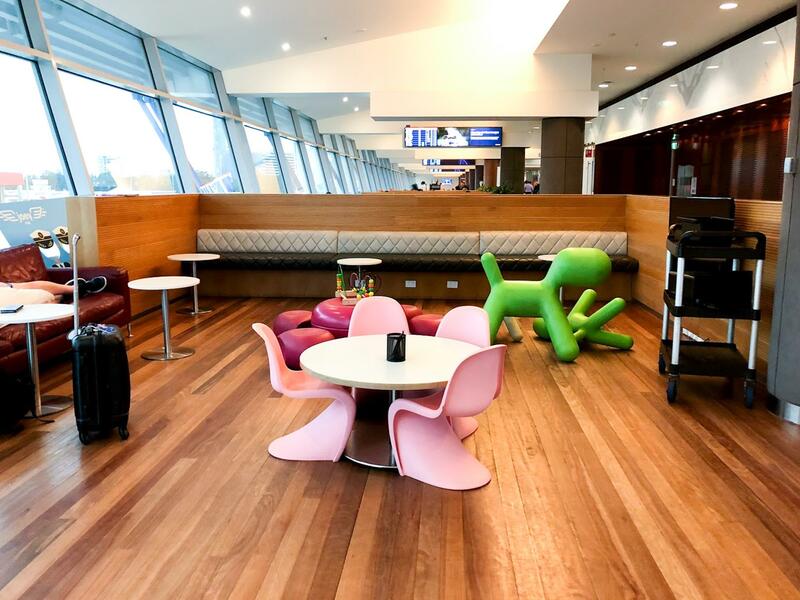 A family space is located at the top-left of the lounge, with some funky colourful furnitures. Moving ahead is a large stretch of windows offering excellent tarmac views and sunlight. To the right of the lounge, you guessed it, is even more seating. 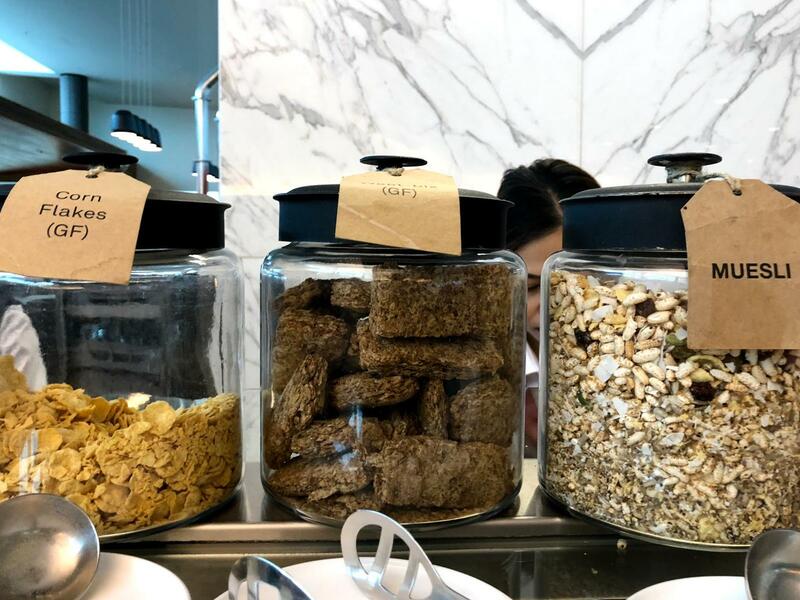 For breakfast, hot items on offer include baked beans and boiled eggs. 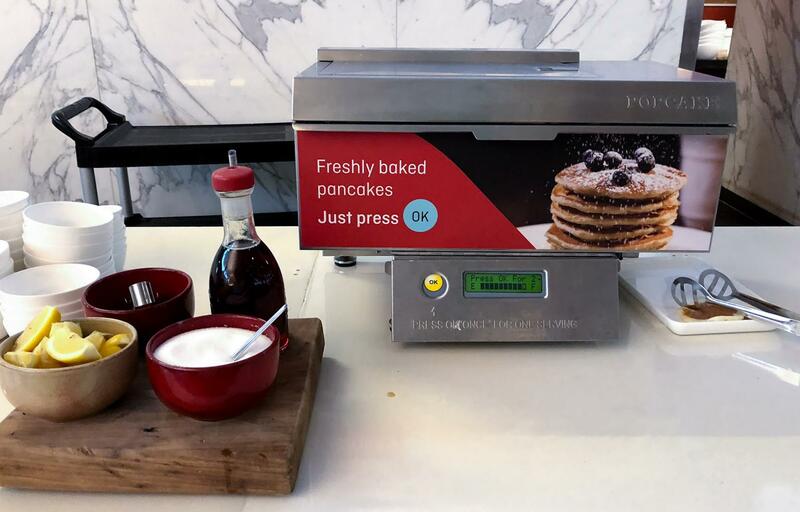 Fresh pancakes are available just a press of the button away from the pancake machine. 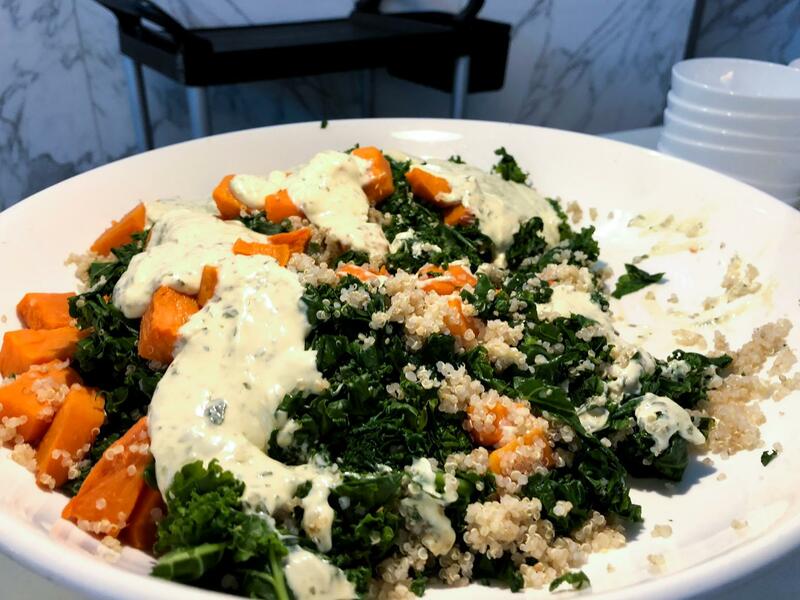 For something a bit different, you can indulge in a breakfast salad of kale, pumpkin and quinoa. Of course, there is always the option of making your own pressed sandwich with a selection of bread and deli items. 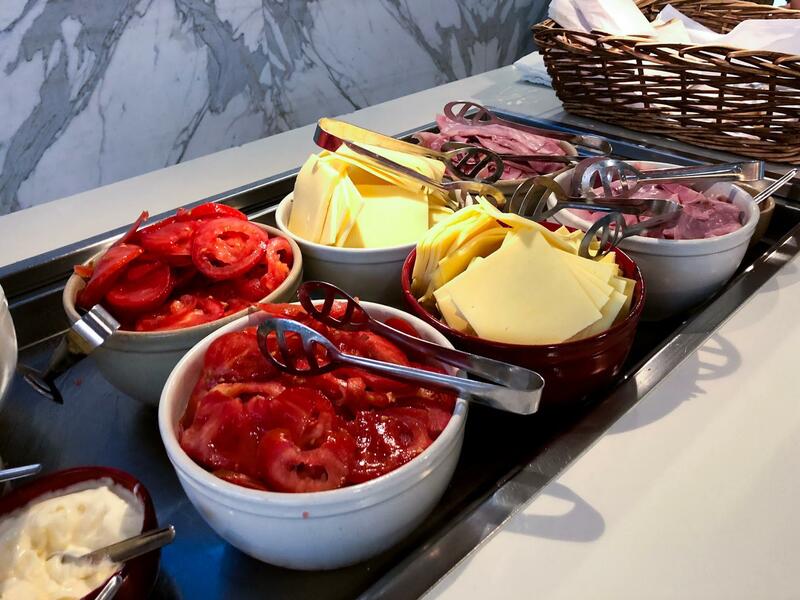 For lighter continental options, there are fruit and yoghurt bowls. Gluten-intolerant passengers also have a few safe options to choose from. 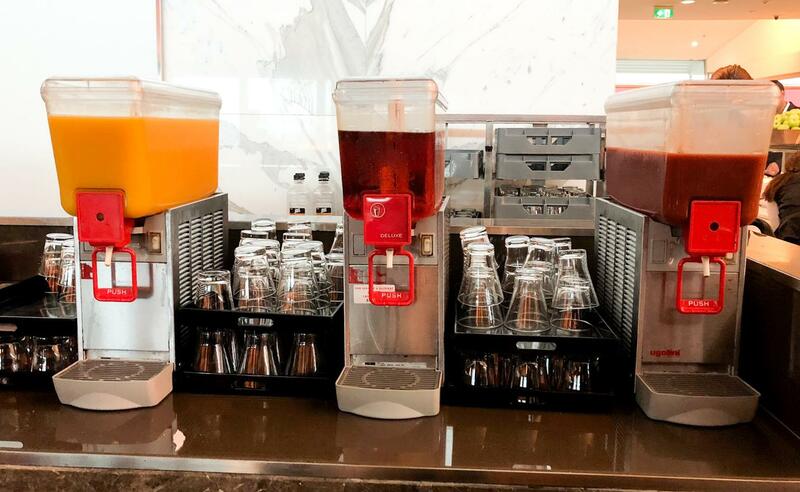 Chilled drinks, assorted fruit juices and refreshing infused water are available on dispenser. Unfortunately for international time travellers, the tended bar only opens at 12pm. 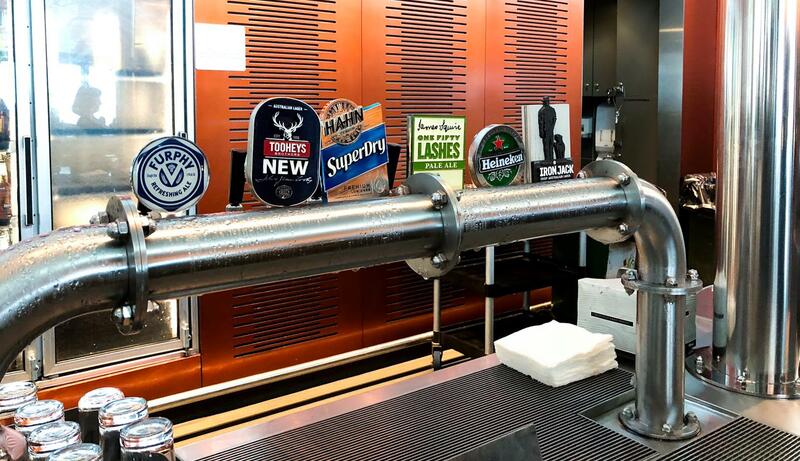 But in the afternoons, you can expect the usual selections of beers, wines and spirits. Barista coffee is available at two stations, one of which is next to the bar. 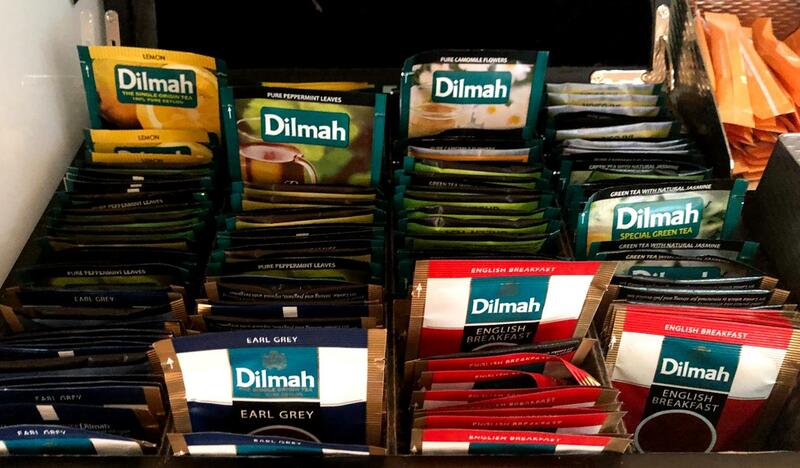 You can also brew your own tea. 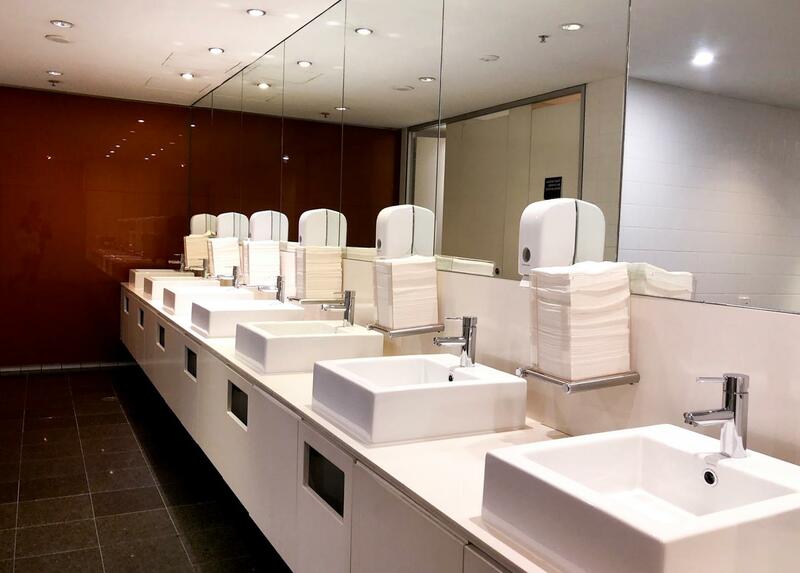 Bathrooms are clean and basic, although they lack the extra amenities and style found in the newer Brisbane and Melbourne lounges. A few individual shower suites can be found in the same area as the bathrooms. 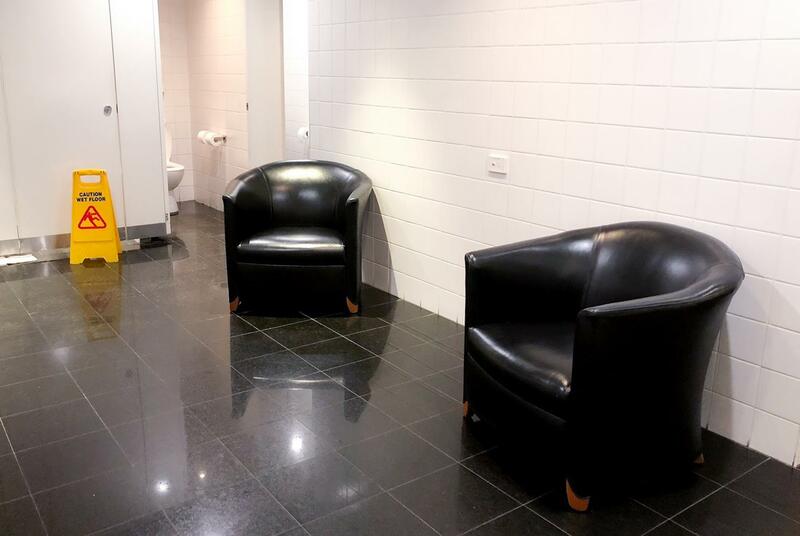 Unfortunately during our visit, all the showers were occupied with a long queue of weary travellers, so there are no photos to show here (except one of these mysterious chairs in the bathroom). 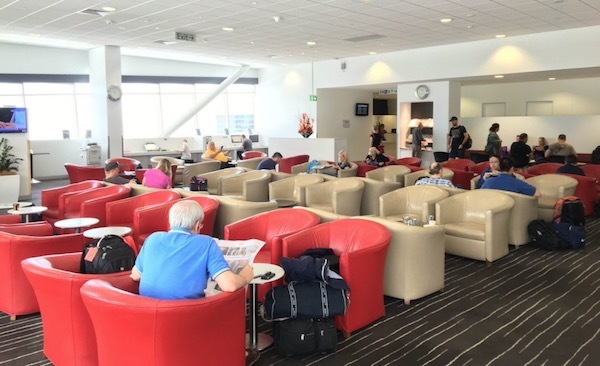 The older lounge areas and the dining areas do not have much in the way of power ports, but there are plenty in the business centres and the new lounge extension. 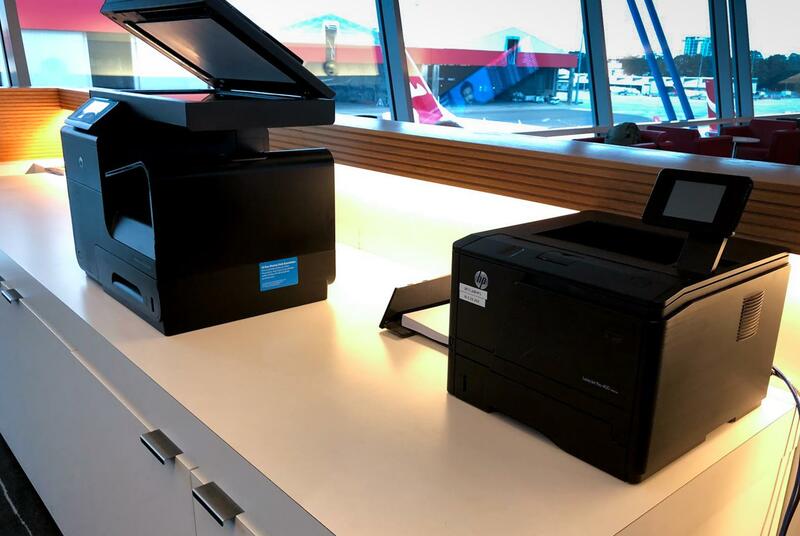 There is also a printing and recharge station for last minute work. WiFi was speedy at around 30 Mbps for both downloads and uploads. 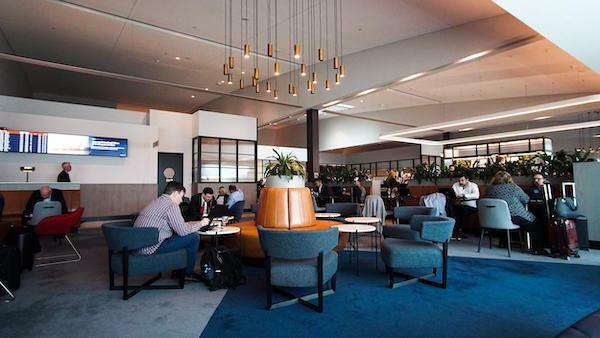 The Sydney Qantas Club now pales in comparison to its modern siblings in Melbourne and Brisbane, and we can’t wait to see its makeover become a reality. 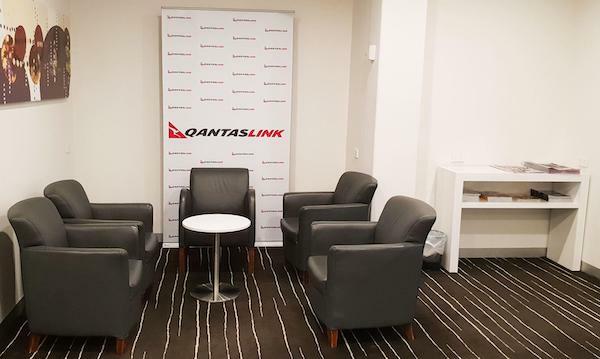 For now though, it holds its own as a base-level Qantas Club lounge. 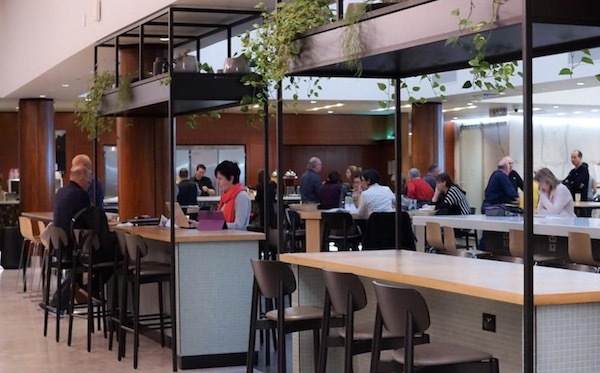 The food and beverages are generally decent quality as usual and it has all the mod-cons you’d want from a pit stop – good WiFi, places to charge and shower facilities if needed. 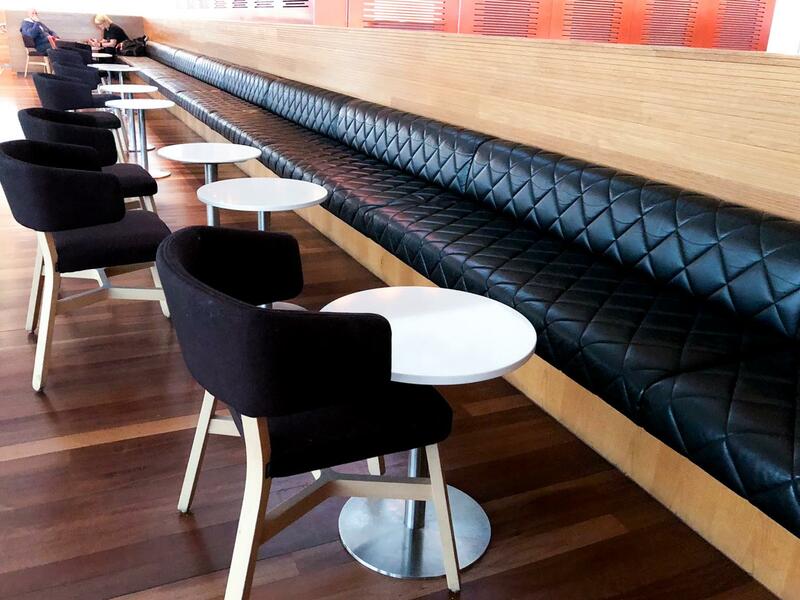 The refresh of the left side of the lounge has a great ambience and can sometimes be a quieter place to work. 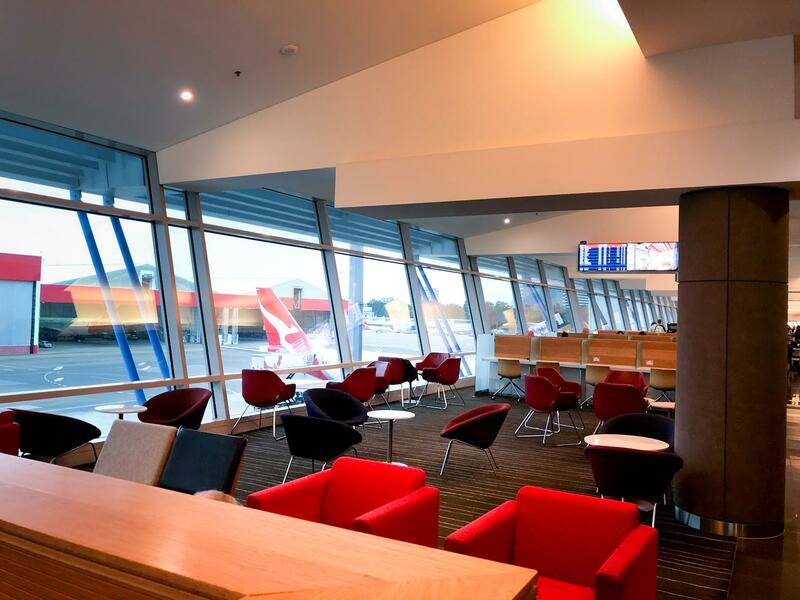 Extensive tarmac views give a decent amount of natural lighting into the lounge. 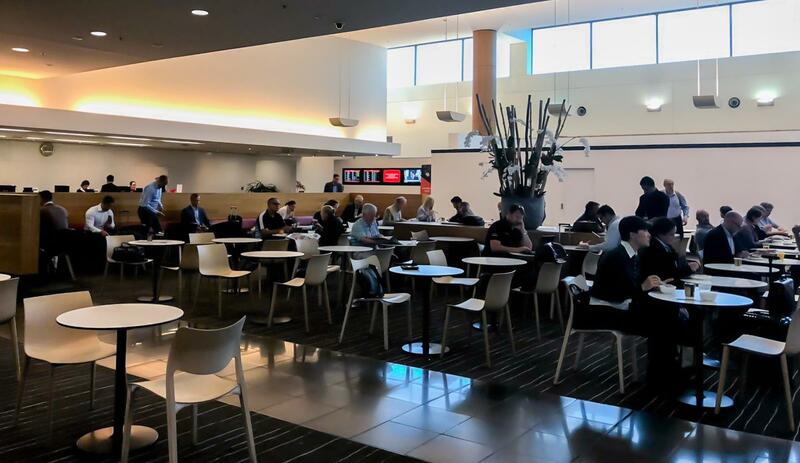 On the downside, the Sydney Qantas Club can be very busy especially during the peak periods of early morning and evenings, but hopefully any future refurbishments of the lounge will increase capacity minimise this issue. The interior is also a bit dated and well due for a make-over. 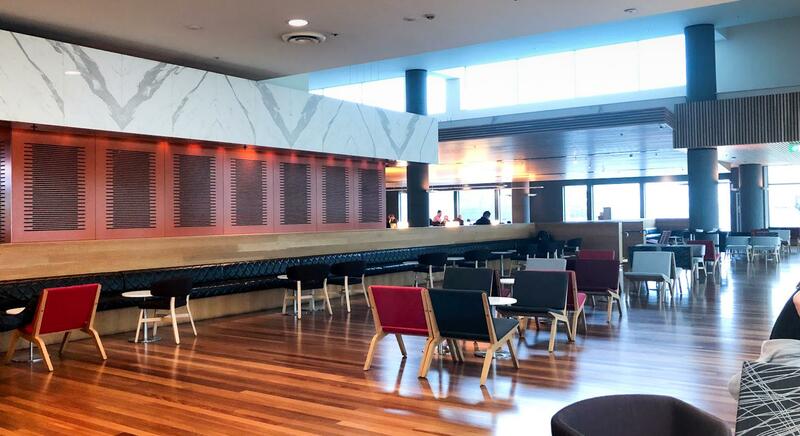 Overall, however, the Qantas Club is a better-than-average lounge for Qantas Club members and Gold or oneworld Sapphire frequent flyers to relax before their next flight. Jetstar flight departs from T2 while Qantas leaves from T3. 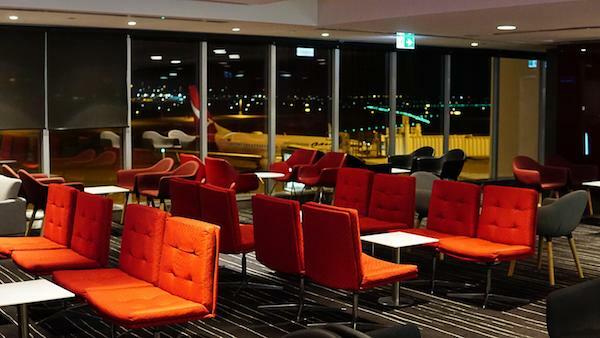 As a Qantas gold, would it be possible to go to T3 to use the lounge if I’m flying Jetstar? Yes, its definitely possible, but just make sure to allow yourself plenty of time to return back to T2 and pass through security.